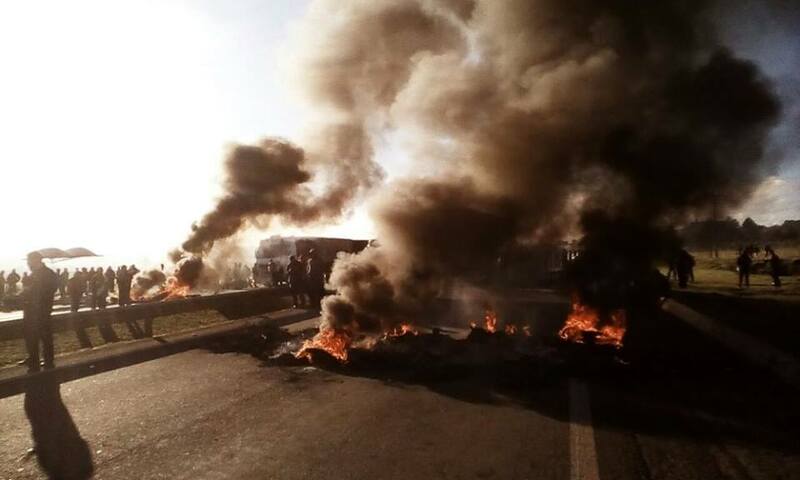 In the following essay members of Coordinación Anarquista Brasileña, a member group of the Anarkismo network, analyses the series of mass protests, riots and rebellions which have rocked the State and its elites in recent months. Originally published by Coordinación Anarquista Brasileña. Machine translation which first appeared at the anarquismo blog. Brazil is experiencing a political earthquake, exposing the rottenness of the country’s elite and further weakening the bonds that hold them in power. The orchestrated operation that led to a recording between President Michel Temer and owners of beef company JBS over hush money payoffs has altered the balance of forces in the country and pours gasoline on an already existing political and social crisis. The government is having more difficulty in mobilising its base amid the instability and with moving forward its retirement reforms and attacks on the rights of workers. That’s no reason to celebrate, we must not take anything for granted. Now is the time to move, amass mobilisations blocking the streets, from strikes to general strikes to lock out welfare cuts and reforms. We must deepen democracy, but direct democracy, where workers in their workplaces and homes study and decide the country’s direction. We cannot accept crumbs from above, we need to impose a popular program of social rights built and decided by the people. We need to build direct democracy in neighborhoods, in the favelas, in the slums, in the occupations of land and housing, factories and schools outside of the State’s purview. Temer’s coup that deposed the leftist Workers Party (PT)/PMDB presidency in 2016 enabled the successful beginnings of tough measures brought against the people at an overwhelming pace, with broad support in Congress and in the media, especially through television network Globo. Michel Temer approved reforms of education, a State expenditure cap, outsourcing, privatisation and other attacks — many which had been begun during the government of the PT itself. The bureaucratisation of decades of struggles by large union federations and a practice of co-opting the leaders of major social movements by PT helped and still helps to demobilise the people and hinder the massification of resistance against these attacks. However, other sectors such as indigenous students have given renewed encouragement to the social struggle. Growing popular dissatisfaction with retirement and labour rights reforms has manifested itself with a big impact on the streets, in demonstrations for the general strikes of April 15th and 28th. With poll rejections of more than 90%, Temer’s government has no legitimacy to support this false democratic system, which only serves to keep businessmen and politicians robbing and killing the people. PT’s class conciliation government of Luiz Inácio Lula and Dilma Rousseff however was also a government for entrepreneurs and wealthy, with a few crumbs for the poor. And countless allegations of corruption favouring the disgusting relationship between big business and the State remain apparent. Corruption cases are not isolated events, but it does move the wheel of the State and the private sector. That is, the representative system does not serve the interests of the people, those of the political and business class, so they can advance their capitalist projects. That is why “magic solutions” such as privatisation, outsourcing and attacks on labour rights only serve to benefit more entrepreneurs. Likewise are the attacks on social rights, indigenous peoples and their territories, landless peasants, women, LGBTs, the genocide of black people and inhabitants of favelas and slums, the criminalisation of poverty. All are measures and policies for the right and the conservatives, businessmen, landowners, bankers to impose their ideology, profit more, concentrate more wealth and exploit more people. Entrepreneurs like João Dória are no different from other politicians, they are enemies of the people. If professional politicians are discredited the justice system tries to defend its legitimacy with anti-corruption operations to increase their power in the State structure. And that network of the Judiciary, the Federal Police and the Public Ministry, with sectors aligned directly to the United States, has the massive support of the Globo media network to accumulate power for its dangerously authoritarian bias. We must repudiate this escalation and avoid any illusions in salvation through bourgeois justice. Old media plays a crucial role in the tangle of interests that is the ruling class. Globo, the same network that supported the Paraliamentary legal coup last year, constructed and legitimated the current hit, now stands with the stronger side, with the Attorney General’s Office (PGR) and output by Temer. Its purpose is to restore conditions for approving the reforms with the installing of a new president through indirect elections. We cannot underestimate the role that media giants have in the ideological field. The position that Globo has taken against Temer does not mean progress for the masses. In the discrediting of professional politicians it is simply discarding an old bet and reorienting its agenda to leverage the nominations of personalities apparently “outside” the party-political field. It is a strategic move into attack such old media and quicken the pace of democratisation of communication, restricting the power of these companies and strengthen popular media. It is necessary to question the reason for the complaints of such groups, which only arise now. Although some politicians have been discarded and it has triggered some instability, Globo’s activities demonstrates loyalty to the broader agreements between State and capital. The criterion is economic and there is no interest in defending JBS, a company that recently faced “Operation Weak Meat” — an action that, if one side showed the terrible condition that our food is produced, mainly served US interests to weaken a competitor in the international meat markets. It should be noted that it was the government of PT / PMDB that fattened itself with cash from BNDES JBS millionaires as the company transformed into one of the largest in the world. Down and Left, Direct Democracy Now! The fact is that the demand that led many people to the streets during the one-year government of Temer can become reality: the ousting Michel Temer from the presidency of the republic. And we wonder: What now? What is the next step? We know that with the coup weakened and a weakened vacillating parliamentary base, conditions are currently lacking for a stable handling of labour and retirement reforms. It is now urgent to mass and fight those reforms, to regain rights that were removed by coup leaders of the past and the current situation of PT/PMDB. In addition to stopping the reforms, we need to build a project that will hold the rich to account for the crisis and recognise the political elite, businessmen and media as enemies of the people. Large companies such as JBS owe the government more than R400 billion (£95bn), about three times the value they add to the false Social Security deficit. Only the organisation of the people and pressure on the streets can impede reforms and attacks on social rights. Nothing will come from waiting for parliament. We must prevent entrepreneurs and political elites from reforming and continuing their project. Mobilisation and popular pressure are urgently needed now to prevent the progress of reforms in the midst of this instability. It is necessary to impose pressures on the government with popularly-backed demands, also in the case of a direct election. And the mobilisation of the people today is urgent to prevent the worst-case scenario, which is a suspension of elections in 2018 through a political-military intervention and the persecution of militant sectors of the left. The left’s electioneering aims to land the Presidency of the Republic so a new Lulismo can emerge, as in years ago, presenting themselves as a supposed popular saviour amid the earthquake of political crisis. They can not fool us! We have said and continue saying: PTism must be overcome and all its inheritance on the left. The belief that Lula will be able to confront the crisis and bring improvements in the lives of those below has no basis. Lula’s election would represent just another class pact with the bourgeoisie on even more onerous terms than previous years. The important thing now is that the fight has to be from below and in the streets to advance popular rights! Promote organisation, mobilise against pension reform and labour rights attacks and build a popular project regardless of class. Catalyse the popular revolt and dissatisfaction with progress to promote militancy. Don’t get carried away by supposedly easy solutions of “reorganising the left” and making a new deal with bourgeois democracy — there are no rabbits to be pulled from that hat. The key is to build grassroots organisation in neighborhoods, in schools, in workplaces with the poor and oppressed people. We must demand the suspension of all anti-political measures initiated in the PT government and continued by the Temer coup. The moment is unfavorable for us oppressed and downtrodden, but the crisis and the dispute between elites opens room for other projects. We need to use this dissatisfaction to delegitimise the system and channel social struggle. Direct Democracy Now! By the suspension of all anti-political action! Against the fiscal adjustment and cuts! Get out putschist Globo! Build the Popular Power against adjustment and repression! This essay is an edited machine translation of an article which first appeared at the anarquismo blog. Any problems lets us know! Previous post: #NoG20 #Hamburg June 24th Demonstration: We are here! Next post: Has The #BlackBloc Tactick Reached The End Of It’s Usefulness?